The Qatar National Report 2017 represents the second consecutive year that QDB has tracked rates of entrepreneurial activity; assessed the characteristics, motivations and ambitions of entrepreneurs; and explored the attitudes societies have towards entrepreneurship across world economies. This report draws on extensive market research involving the collection of high-quality data gathered from nearly 2,700 interviews with residents of Qatar across all nationalities and genders. Highlighting the key characteristics of SMEs in the State of Qatar, and studying the overall SMEs’ performance based on combination of indicators at macro-economic as well as firm specific level. This flyer highlights the specific definition for SMEs in Qatar, starting with the importance, then the presents the definition details according to each sector, in addition to explain simply how to use the definition. This report is the first outcome of the research project “Home-based Businesses in Qatar: Current Reality and Mechanisms for Advancement”. The report aimed at highlight and analysis the main results of the said survey, which covered a sample of (535) home-based businesses in Qatar, discovering their demographic characteristics, business experiences, needs, challenges, and their future orientations, in addition to highlight reasons behind discontinued businesses. This output – which forms the second phase of research project “Home-based Businesses in Qatar: Current Reality and Mechanisms for Advancement”—is concerned with reviewing the results of the exploratory study of Gulf and international experiences and expertise. The study qualitatively analyzed relevant publications with a focus on reviewing government efforts to establish a regulatory and legislative framework to support HbBs, as well as supporting initiatives. This study is the third and last paper of the research project “Home-based Businesses in Qatar: Current Reality and Mechanisms for Advancement”. The study comprises five main sections other than the Overview and the Conclusion. It discusses three issues: What are the challenges facing HbBs in Qatar? What are the mechanisms proposed for the advancement of HbBs at the national level? And finally what are the critical success factors to be observed? 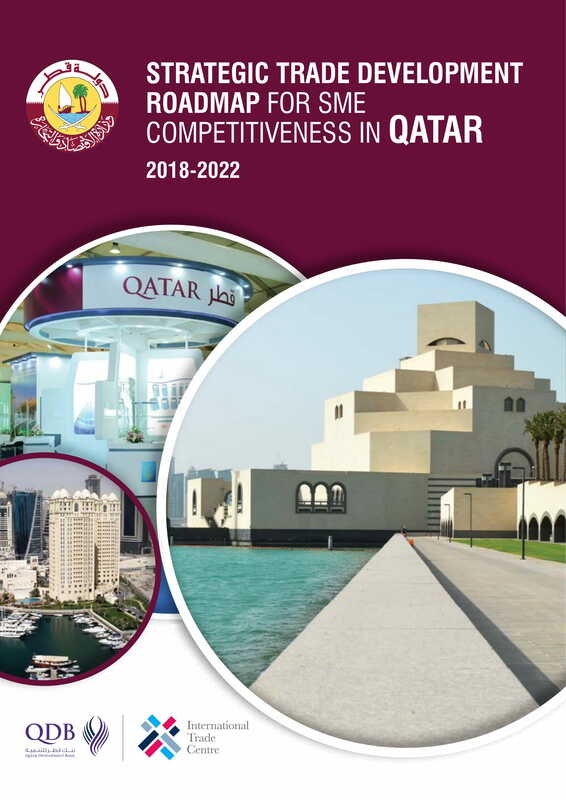 Qatar’s Strategic Trade Development Roadmap (STDR) report is to set the small and medium-sized enterprise sector on the course of strategic development by addressing constraints in a comprehensive manner and defining concrete opportunities that can be realized through the specific steps detailed in the initiatives’ section in this report. 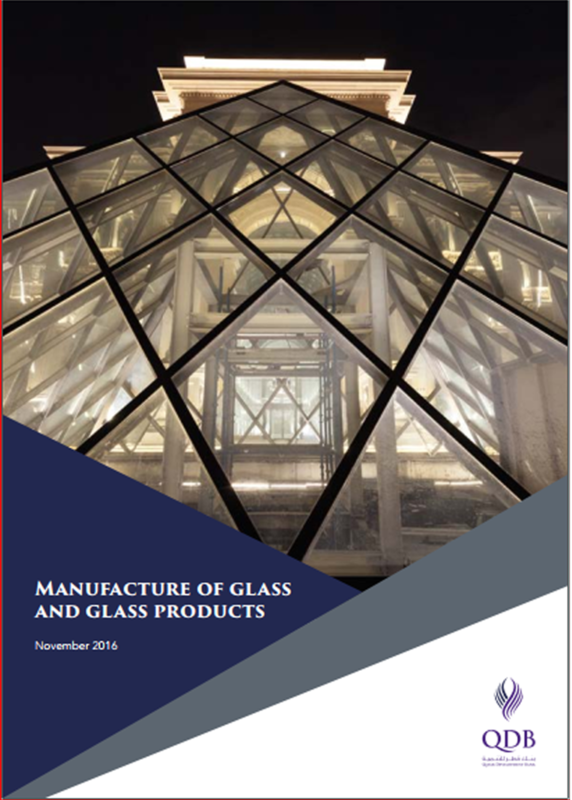 This report studies the “Manufacture of Glass and Glass Products” in Qatar. It categorizes the glass and glass products manufacturing by type, which includes production of flat glass and its downstream products, glass fiber, container glass, domestic glass products, and special glass products. Qatar, which was traditionally reliant on imports across all segments of the glass and glass products industry, has witnessed increasing participation from local SMEs. Currently, there are 13 companies, all of which operate in the flat glass-processing segment. These companies have developed substantial capabilities and currently offer a range of innovative products to the construction sector in Qatar. The gross value added by the domestic glass-processing sector has grown by over ten times from 2006 to 2014. 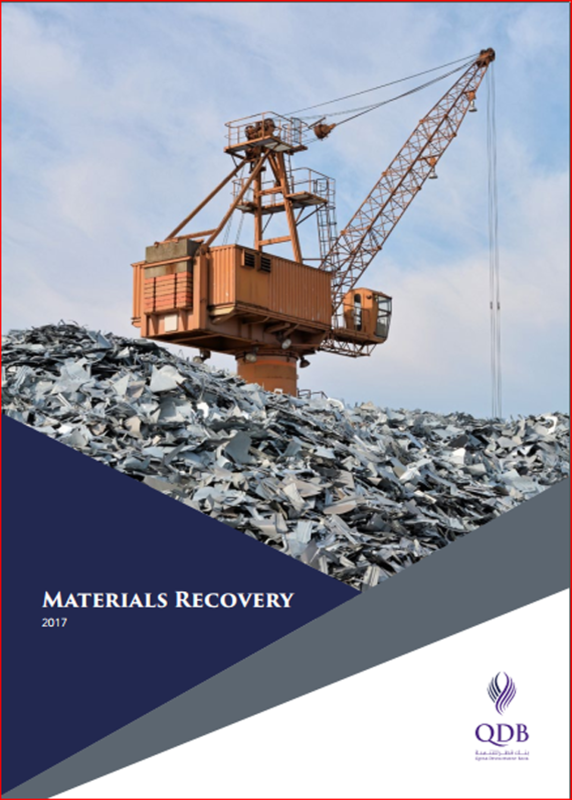 This report covers “Materials Recovery”, a sector that is likely to play an instrumental role in dealing with the environmental challenges facing Qatar. Segregation of waste at source is a major challenge facing solid waste management activities in the country. The rate of recovery and recycling of waste is linked to the stage of waste management at which an item is captured and separated. There is a large quantum of waste generated in Qatar, majority of which is not recovered and ends up in landfills. These landfills are also running out of capacity. Our government is cognizant of the environmental impact of these landfills and the need for a robust material recovery. Various initiatives are currently under consideration, which is likely to transform the material recovery sector, making it more attractive for SMEs. 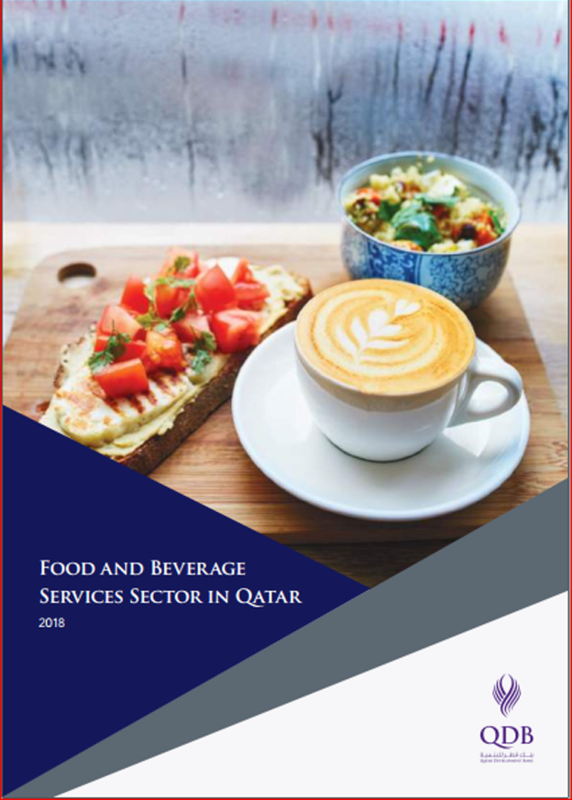 This report covers the “Food and Beverage Services Sector in Qatar”, which is an integral part of the hospitality sector. This sector comprises of sub-segments such as fine dining, casual dining, quick service restaurants, cafes, cafeterias and mobile food trucks. Qatar’s F&B sector currently has 2,590 operational units with estimated cumulative revenue of QAR6,993mn in 2016. The sector is an intrinsic part of Qatar’s economy and offers numerous opportunities for entrepreneurs that are looking to develop a homegrown concept or to partner with a franchised restaurant concept. Setting up a new F&B unit is a straightforward process with relatively low upfront investments making it attractive for SMEs. 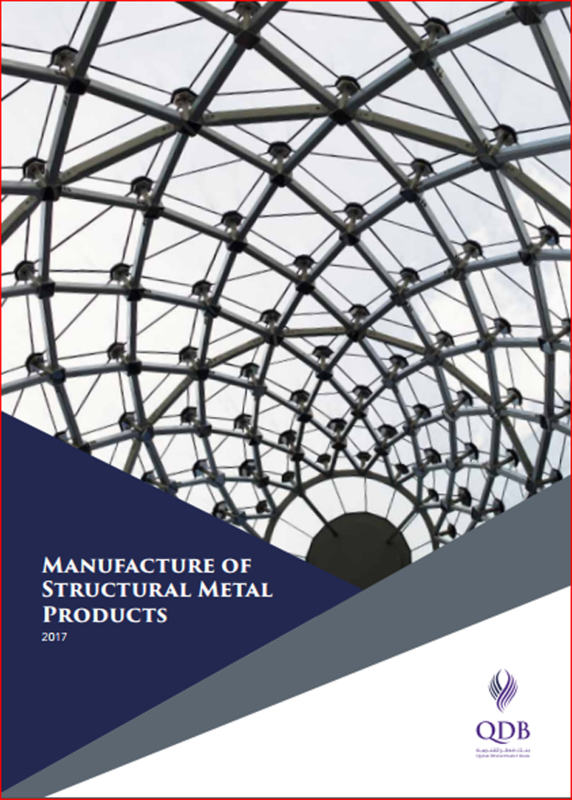 This report covers “Manufacture of Structural Metal Products in Qatar”. This sector comprises architectural steel fabrication, structural steel fabrication and pre-engineered buildings and was valued at QAR4,141mn in 2015, a tenfold growth as compared to where the sector stood in 2001. This also represented a reduction in the country’s dependence on imports from almost 90% to in 2005 about 45% in 2015 of the annual requirement during this period. The growth in the gross value-added by the sector also registered a similar growth, to reach QAR1,806mn or 43.7% of the sales in 2014. The aim of this report is to inform policy makers, academics, and practitioners about the multidimensional nature of entrepreneurship in Qatar during 2016. 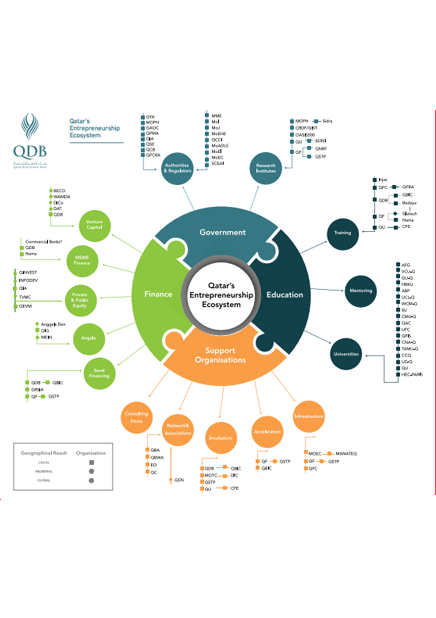 Qatar's entrepreneurship ecosystem map consists of a complex network of institutions and organizations that support entrepreneurs and help to build a knowledge-based economy. The ecosystem plays a vital role in achieving the vision for the State of Qatar. Qatar’s entrepreneurship ecosystem, which is segmented into four key areas: government; education; finance; and support organizations. This report covers Qatar’s cocoa, chocolate and sugar confectionery-manufacturing sector. Qatar, which was traditionally reliant on imports of almost all major products under this sector, has witnessed increasing participation from local establishments that are engaged in the production of a wide assortment of chocolates and Arabic sweets. The sector forms an integral part of the food and beverages industry and its future growth will be closely associated with the overall development of the entertainment, hospitality and tourism sectors in Qatar.